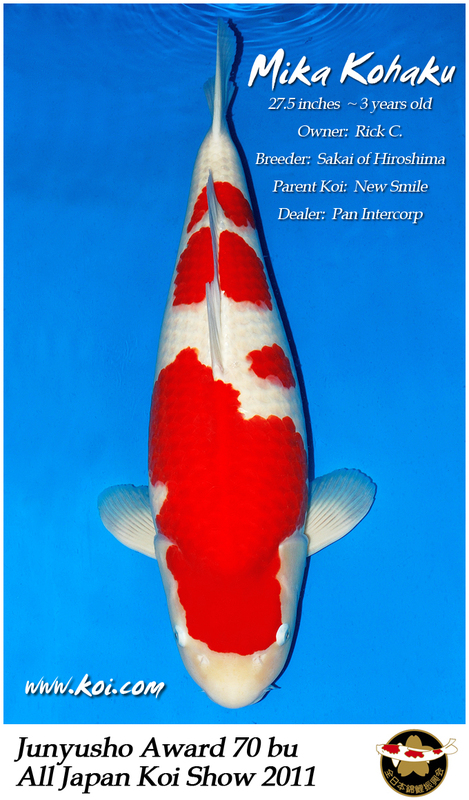 Rick’s Kohaku is a 3 year old daughter of “New Smile” from Sakai of Hiroshima and is affectionately named “Mika”. She measures just a little under 70cm. Mika took the 70Bu Kohaku Junyusho Award at this years All Japan Combined Koi Show. Arguably one of the most competitive size categories in the show… Mika held her own to bring home an award in her first outing. Definitely not too shabby for her first foray into the Greatest Show on Earth. This entry was posted in Awards, Koi Event, Koi Shows on February 1, 2011 by koiadmin.